Last month I attended the second Google Apps for EDU European User Group (GEUG12) meeting which was held at the University of Portsmouth. The meeting was aimed at members of educational institutions which have signed up to Google Apps in Education, but I was invited to chair one of the sessions. I found a great deal of enthusiasm of the value which Google Apps can play not only in the panel discussion which I chaired on Embedding Google Apps in the Institution but also across the range of presentations which were given during the day. [Note After publishing this post I came across Sarah Horrigan’s Event Report: Google European User Group 2012 post in which she described how “One of the things that was most interesting from this session [of student portals] was the student response to it – they LOVED it” and pointed out that “Universities feel comfortable moving to Google when others have already moved. For example, 25% institutions in Spain now on Google Apps“]. I was particularly interested in the talk given by Sarah Horrigan, Learning Technologies Manager at the University of Sheffield on Opening up our Practices – Going Google. The event organisers streamed several of the sessions and have provided access to recordings of the talks so I was able to replay Sarah’s presentation. 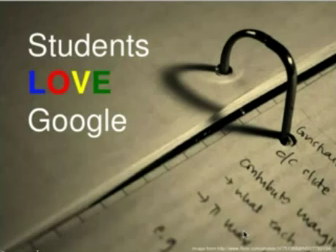 Our students love Google. They don’t just like it, they love it. The Students Union did a survey on technology in learning and teaching. One of the questions they were asked was “What web sites or online services could you not live without?” Do you know what came number 1? It wasn’t our VLE! It was Google Apps. They love it: everything from Docs to Mail to Scholar – the whole shabang! They love Google Apps. We made the decision to move to Google for students nearly two years ago, and are just in the process of moving all of our staff over. That will be for mail, calendar, docs, chat, etc. we see it as much more than just mail. The data side isn’t an issue. Google store all of their data under the safe harbor agreement which is perfectly sufficient for UK data protection/privacy law – I have personally confirmed this with the ICO. And anyway, even if it was all held in Europe, it is still covered by the Patriot Act if it is a US company. I can see no reason for any HE IT department to run their own email service. I picked up on the importance of being aligned with one’s user communities a few days after I attended the GEUG12 event. In the session on New to the Sector? New to Web Management? New to IWMW? I suggested that the perform storm which has hit the sector, in general, and IT and the Web in particular means that there is a need to revisit assumptions about the role of the institutional Web team and the approaches taken to delivering this role – and, perhaps, to unlearn established beliefs and conventions. I illustrated this point by giving a specific example: the role of events such as the IWMW series. 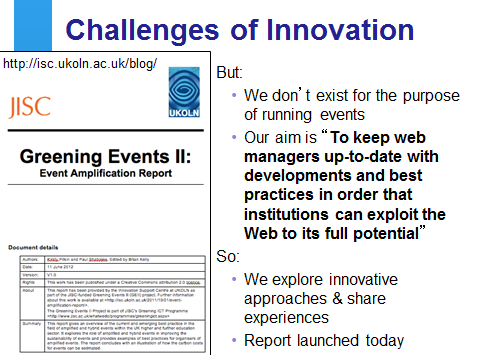 UKOLN does not exist to provide a successful IWMW event; rather our aim is to ensure that the event delivers a specified objective for its community: “To keep web managers up-to-date with developments and best practices in order that institutions can exploit the web to its full potential“. In the talk I explained how technological developments were changing the nature of events and external factors, such as reduced levels of funding and environmental concerns, meant that we needed to not only acknowledge that the nature of our events might change, but that we should also be prepared to be instrumental in leading such changes – something we have been doing in our role in delivering amplified events and, in particular with our Greening Events II: Event Amplification Report” sharing best practices with others. I went on to argue that institutional Web teams need to ensure that they are aligned with institutional aims and with the needs of their user communities. Easy words to say – but what if they are in conflict with well-established cultural norms in Web and IT teams? We have seen an example in students are happy with the services provided by Google, suggestions that staff did not want to be left behind and the IT Service departments is aligned to support these preferences. But is this the norm in the sector? Are we more likely to see users, IT staff and perhaps Web teams arguing for their preferred technological environment? And perhaps the argument “we use open sources solutions” in preference to licences solutions is becoming increasingly redundant when there are Cloud service providers? Note that a video recording of Sarah’s talk on Opening up our Practices – Going Google is available on YouTube and embedded below. As I say in the blog post, we’ve had excellent results from getting out there to talk to our punters about options and future directions, and actively soliciting a steer from them. This does run counter to “IT department culture”, though, and may be difficult for some people to come to terms with! The summit is a fantastic two day event taking place in the International School of Prague on Saturday October 13th and Sunday October 14th. The summit is focused on helping you get the most out of Google Apps for Education in both ‘primary/secondary schools’ and ‘Higher Education’ environments. We have sessions lead by some of the worlds leading Google apps experts including Google staff and Google Certified Teachers and trainers. There will be sessions for teachers/lecturers, school administrators and school IT managers. We guarantee you will leave the summit with knowledge that you can take away to your school and start using straight away. In addition we will have a ‘Chromebooks playground’; A dedicated classroom with experts on hand where you can drop in at any time during the conference to try out Google Chromebooks.